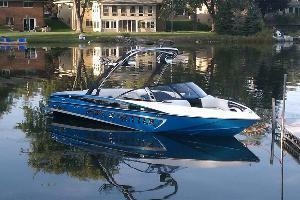 We have the best wakesurf boat rental available on Lake CdA. Our boat is not some small runabout boat with a tower on top that is touted as a "wakeboard boat". Our Boat is a 22' Moomba Mobius wtih a V-drive, rock-solid tower, swim platform, plug and play ballast system, cranking ipod compatible stereo with 9 speakers and tower speakers so you can surf to your favorite tunes! The boat is black with cool splash graphics so you look great on the water We include all wakeboards, surfboards, wakeskate, kneeboards, water ski, and innertube with your rental FREE! We have sizes for all ages. Life Jackets are also included at no additional charge. 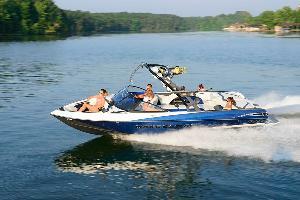 We do everything we can to insure you have a fun, safe, and memorable time on the water. You and any other user of the Rental Equipment are familiar with the operation of, and have the ability and a valid license to operate or use any Rental Equipment you rent. You will comply with all applicable laws and regulations in your use of the Rental Equipment. You will not use the Rental Equipment under the influence of alcohol, drugs or any other substance that may impair your ability to operate the equipment. You will not use the Rental Equipment in connection with stunts, racing, towing of persons, or any other use which might result in injury to person or damage to property. You are liable for any and all damage to the equipment, including but not limited to: propeller, outdrive, engine, hull, carpet, upholstery, wake-boards, and lifejackets. Toyboxcda maintains their equipment in excellent condition, please treat our equipment as you would your own. Renters must take reasonable care of the Rental Equipment which includes the following items: seats and upholstery, carpeting, gelcoat, outdrive, hull, and all included toys and lifevests. Renters are prohibited from using the Rental Equipment for racing, stunting any illegal activities or carrying passengers above the manufactures stated amount of acceptable passengers. Rental Equipment is intended for personal use only and cannot be used for commercial or for-hire purposes. Please keep the Rental Equipment clean. Do not operate the Rental Equipment in inclement weather. Do not use the Rental Equipment for illegal or dangerous activities. Do not use the Rental Equipment for contests, exhibitions, or races. Please return the Rental Equipment on time and with a full tank of gas. NO Pets will be allowed in vessel, unless $25 nonrefundable pet deposit is paid. Pets are NOT permitted on upholstery. If there is any evidence of a pet that was not disclosed at the time of reservation, you will be subject to a $50 fee. NO Beaching of vessels. Boat must be anchored, tied to a buoy, or docked when not in use. Renters MUST REMOVE any Keys from vessel when not in use and take cautionary measures to prevent any damage or theft while not in use. Renters CANNOT operate Rental Equipment while under the influence of any drugs or alcohol. Late Fee: Renter will be given a 30-minute grace period for Rental Equipment returning. Without limiting any other remedies available to ToyBoxCDA, after 30 minutes, late fees will be deducted from your deposit or charged to your credit card as stated in the Fees Policy ($50 PER 1/2 HOUR). Failing to show for scheduled Rental will be considered a cancellation. Please see Cancellations and Refunds. Additional Operators: The Renter agrees and understands that all additional operators of the Rental(s) Equipment must be at least 16 years of age (or older if required by law) with a valid driver's license and trained by ToyBoxCda at the time of rental.